Does anyone have any information/insight into this person and group? I've found only a few notes online about the controversial nature of him, with little details. They seem to have a lot of money, seeing as they purchased two old churches here in San Francisco and transformed them quite beautifully. I have read to be weary of anyone claiming to be a "living Buddha". I don't know anything, there doesn't seem to be much out there. But the obvious approach is to be as skeptical as possible-- proclaiming to be an incarnation of Vajradhara, but then no one has heard of him-- except supposedly for all the high teachers quoted in his own book-- we'll see. Then, I do have to appreciate the style, the photo with the obviously fake wig? My instinct is that this guy is a performance artist on a far-out trip. 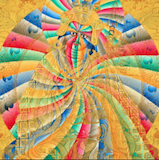 But who knows, maybe he really is Vajradhara-- and Vajradhara is emanating as a performance artist on a far-out trip! The main thing is, I wouldn't start prostrating to this dude just yet. Examine for 12 years, see what happens in the interim. In the meantime, there are plenty of great teachers, especially in the SF area - that are clearly of authentic lineage and are not controversial. Like Anam Thubten RInpoche, Lama Tharchin RInpoche, among others. .
Brian wrote: Does anyone have any information/insight into this person and group? I've found only a few notes online about the controversial nature of him, with little details. They seem to have a lot of money, seeing as they purchased two old churches here in San Francisco and transformed them quite beautifully. The pdf/ebook file available in the first link is a trojan of one type or another. My computer refused to download it. Maybe you should refuse to associate with DCB III? Looks awfully dodgy to me. Saw him on one of those Buddhist Cult listings years ago. Also "How to Spot a Buddhist Cult". "living buddha" is the Chinese equivalent of Tibetan tulku. 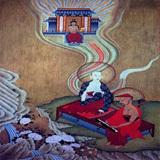 It should be based on the teachings that a group is rejected or accepted and not subjective lists of "Buddhist Cults". and tell me if you think it's authentic Dharma. Personally, I feel including this group on "cult lists" is the right thing to do. 100% fake. A tulku friend told me he bribed a student from Sakya College Dehradun to forge a 'recognition' letter on headed notepaper from HHST's office; when this was exposed he offered the Karmapa Urgyen Thrinlay Dorje money to recognise him; when this was rejected he rejected him as the authentic Karmapa! You have only to look at the nonsense put about by this organisation to see that it is, at best, a parody of Dharma. All of this brings us to another, yet connected subject. I have heard about so-called "monks" who are actually Chinese communist agents in disguise. I do not know much about this issue or its purpose. What i DO know is that the Dorje Chang Buddha III has a lot of money, has purchased very old expensive churches here in San Francisco, has had governmental agencies recognize his 'efforts' and attend grand openings. This seems all very strange to me - could he be part of this Chinese "conspiracy" ? Anyone have any insight into this? I recall once seeing a picture of Chinese troops being handed Buddhists gowns. Brian wrote: All of this brings us to another, yet connected subject. I have heard about so-called "monks" who are actually Chinese communist agents in disguise. I do not know much about this issue or its purpose. What i DO know is that the Dorje Chang Buddha III has a lot of money, has purchased very old expensive churches here in San Francisco, has had governmental agencies recognize his 'efforts' and attend grand openings. This seems all very strange to me - could he be part of this Chinese "conspiracy" ? Anyone have any insight into this? I recall once seeing a picture of Chinese troops being handed Buddhists gowns. Considering the Chinese government kidnapped the Panchen Lama (who is still missing) and replaced him with a puppet-panchen lama who is completely under their control, it is obviously a ploy of theirs to create high-tulku positions and use the "poison" of religion for their own deeply misguided purposes. Additionally, it is no secret that they've been more than supportive of a certain sectarian Buddhist cult that is anti-Dalai Lama and is the cause of much controversy among the followers of Tibetan Buddhism. So does it seem plausible that this character could be an invention of some psyops wing of the Chinese govt. ? Certainly. Ooooh boy this thread is sliding dangerously into the realm of conspiracy and paranoia! gregkavarnos wrote: Ooooh boy this thread is sliding dangerously into the realm of conspiracy and paranoia! If you think this is paranoia then you're obviously not very well informed about Chinese/Tibetan politics. Sometimes I get the feeling that you think that you are talking to a dribbling moron. All conspiracy theories and paranoia have a basis in a smidgen of reality, they become paranoid when the claims are not backed by hard evidence. What is the evidence that DCIII (theoretically a fraud, again no hard evidence) is being backed by the Chinese government? The fact that he has money and is Chinese? Well, really, that's just not enough evidence now is it? Saying something is theoretically *plausible*, and claiming it is *true* are entirely different things. I said it was plausible. Only if I was claiming it were actually so would I ever need hard evidence. I made no such claim. It is plausible, because as in the examples mentioned above there is a precedent for this type of behavior by the Chinese Government. I don't think I am talking to a dribbling moron, but it is evident that English is not your first language. This is no fault of your own, I commend you for speaking a second language at all. I am somewhat of a moron myself like many typical Americans in never having adequately learned a second language. Adamantine wrote: Saying something is theoretically *plausible*, and claiming it is *true* are entirely different things. I said it was plausible. Only if I was claiming it were actually so would I ever need hard evidence. I made no such claim. This is true to an extent but the nuances are so subtle as to really render them virtually indistinguishable. It is plausible, because as in the examples mentioned above there is a precedent for this type of behavior by the Chinese Government. I agree, there are definitely precedents, for me though it is enough that the DCIII site tried to infest my computer with a Trojan for me to conclude that, I personally, want nothing to do with them. these are the first definitions to come up on google, and they are not merely subtle nuanced differences "virtually indistinguishable" -- they have very clearly defined separate meanings that are not interchangeable. gregkavarnos wrote: Sometimes I get the feeling that you think that you are talking to a dribbling moron. fakeeeee, anyone who tries to convince people to follow them because of supernatrual powers are demons!